� Franchise is described as the stoutest bull Triangle J has ever raised. 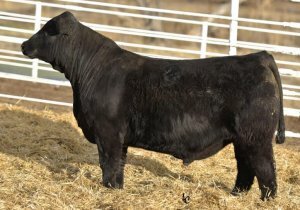 He topped their sale, selling to Jerry Walsh, NE. Jerry bought him to use on his Lock Down and Dream On influenced females. � � Franchise 451D moves out like a cat and maintains loads of body and mass and owns great EPDs too!